Ministry of Planning, Development and Reform has organized “National Consultation on Voluntary National Review (#VNR)” on Wednesday 24th October 2018 at Auditorium, P-Block, Pakistan Secretariat, Islamabad to share the VNR process and seek guidance to improve it further. Mr. Khusro Bakhtiar (Minister of Planning, Development and Reform) chaired the consultation. The first meeting of the new parliamentary Task-force on Sustainable Development Goals organized by Parliamentary SDGs Secretariat on 3rd October, 2018. Mr. Riaz Fatyana (Member National Assembly) is the Chairperson of Parliamentary Task-force. 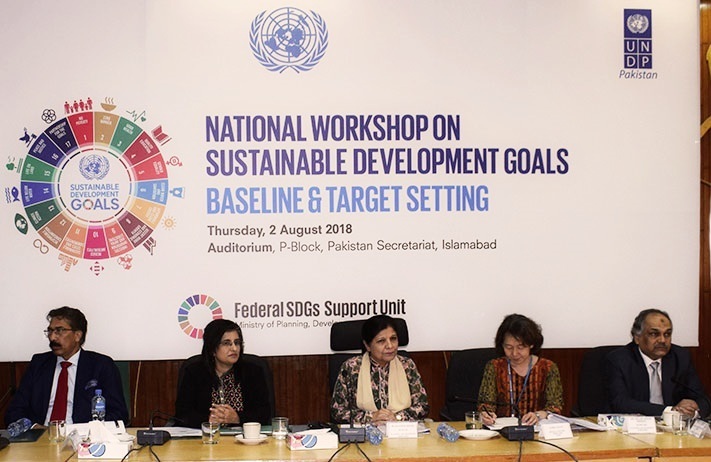 A National Workshop on SDGs Baseline and Target Setting held on August 02, 2018 in the Auditorium of Planning Commission, Islamabad to look into methodological issues. 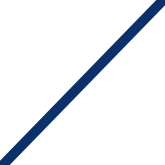 The prime objective of this workshop is to discuss standards and definitions, level of effort to get data, preferred data sources used in baseline and target setting by identifying key methodological issues such as accuracy, reliability, frequency of data, etc. Ministry of Planning Development and Reform holds Pakistan’s 1st National Conference on Sustainable Development Goals in Islamabad. 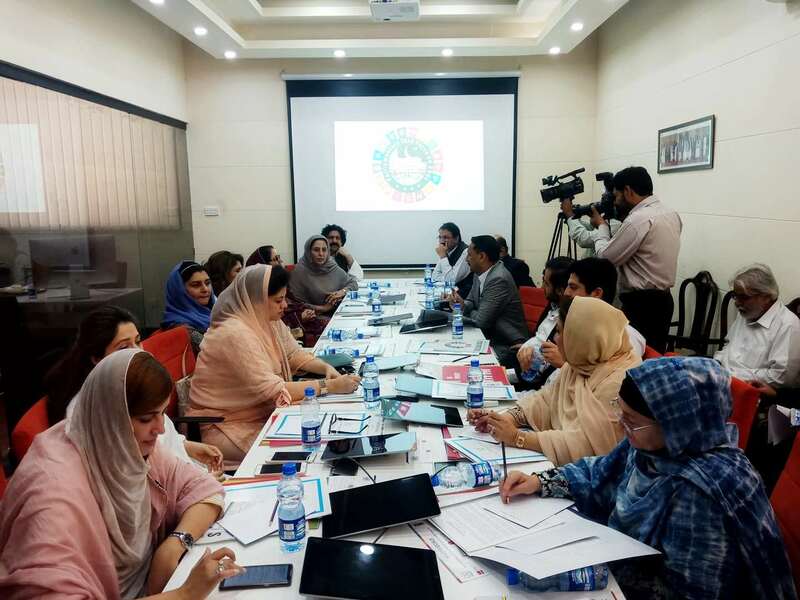 Federal and Provincial SDGs Support Units also presented their progress in localizing Agenda2030 across the country, emphasizing the need of partnerships between all stakeholders. 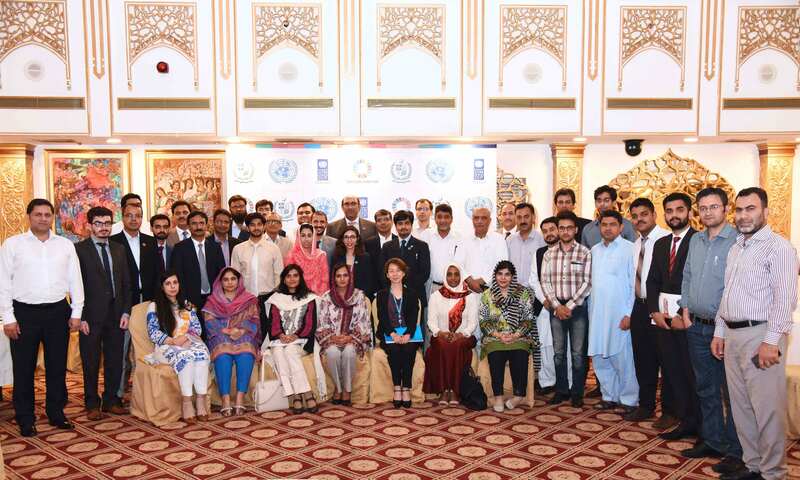 Planning Commission Federal SDGs Section in collaboration with Peace & Justice Network (PJN) Pakistan has organized a “Multi-stakeholder Consultation on SDG 16” on July 09, 2018 in the auditorium of the P-Block Pak Secretariat Islamabad. Over 100 stakeholders from government, CSOs, international development partners, donor agencies, academia, think-tanks and private sector participated in consultation. 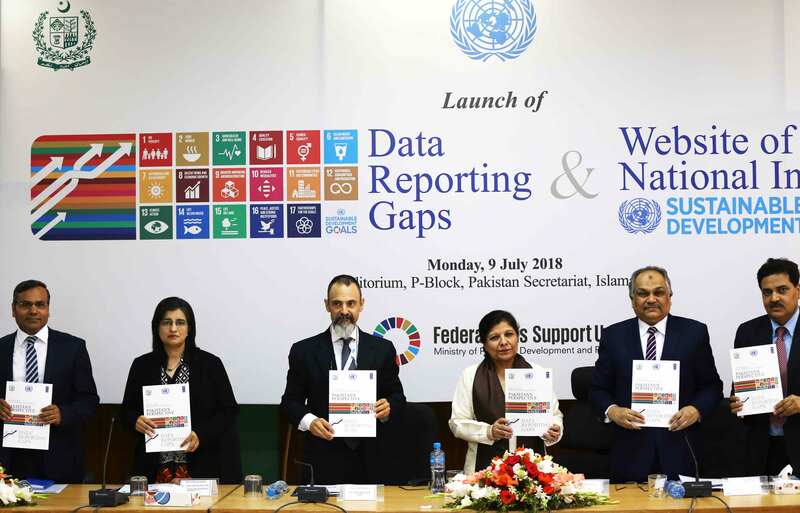 Dr. Shamshad Akhtar, Minister for PD&R formally launched the website and the Data Reporting Gaps Study at the Auditorium of the Ministry of Planning Development & Reform, Islamabad. The Minister maintained that the contextualization of SDGs has a significant role to play and that the sector needs much focus. 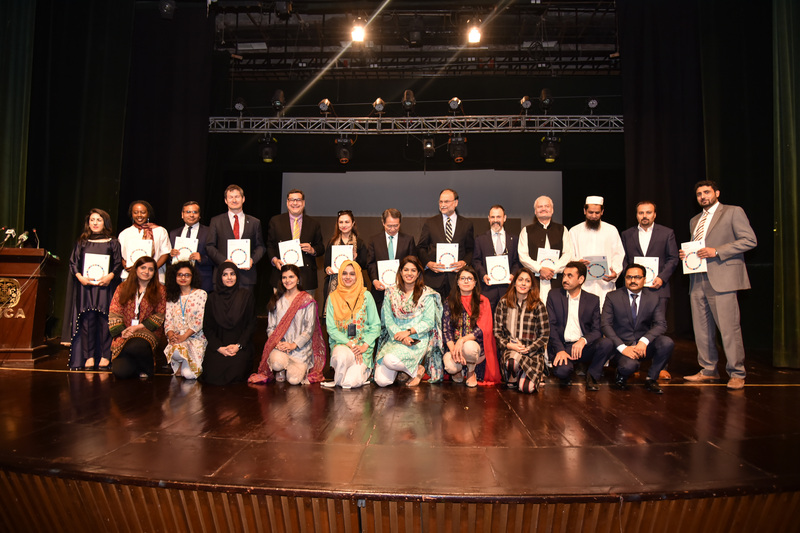 The United Nations Development Programme (UNDP) Pakistan launched its National Human Development Report (NHDR) – Unleashing the potential of a Young Pakistan. This report seeks to understand Pakistan’s human development challenges and opportunities from the prism of youth. 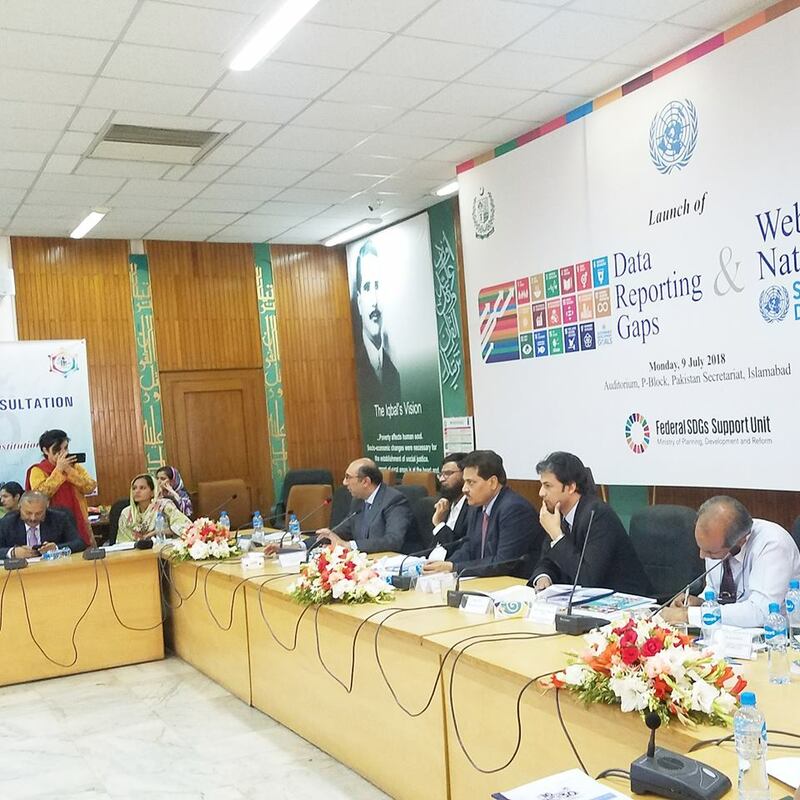 The Planning Commission Pakistan after extensive deliberations and cooperation from provincial and local governments has evolved a national framework for SDGs. The rigorous process started with negotiations at the divisional level in all four provinces where districts in that particular division participated. 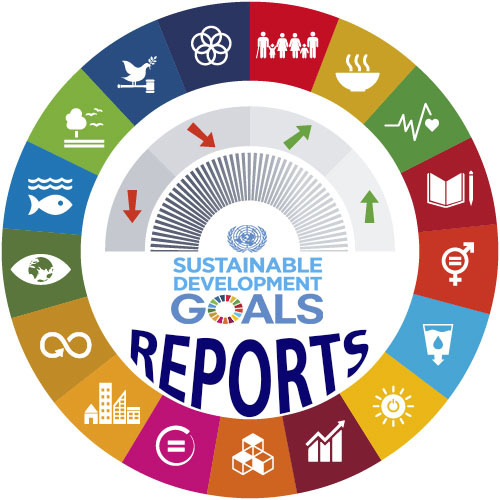 The baseline for 17 goals, 169 targets and 230 indicators was prepared and prioritized; and attempts were made to define what can yield better results in minimum possible time. 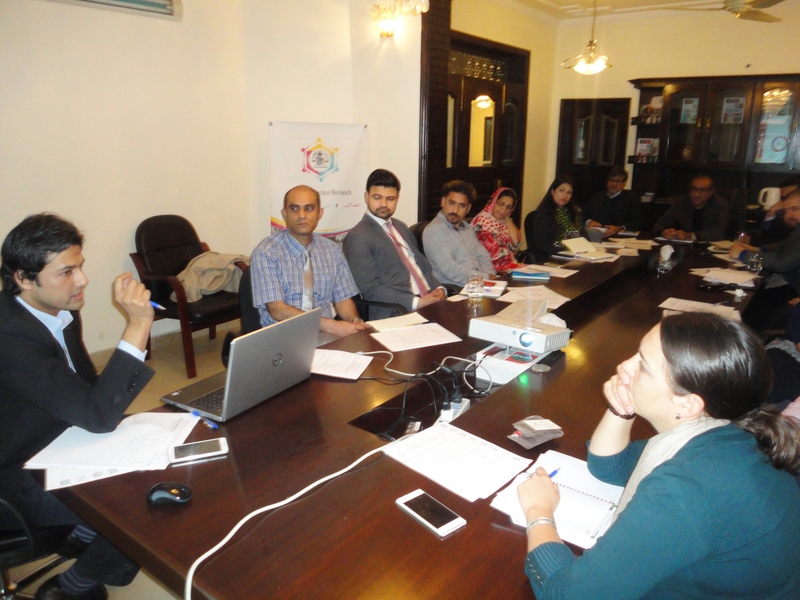 The Peace & Justice Network (PJN) Pakistan hosted the 7th CLSF Co-ordination meeting at the PJN Secretariat in Islamabad on 7 February 2018 around two key objectives 1) Formulation of SDG 16 Plus Data Reporting and Implementation Mechanism for the Planning Commission, Government of Pakistan and 2) Integrating Donor programs in Pakistan with the SDG 16 framework with International Development Partners working on different target of Goal 16. 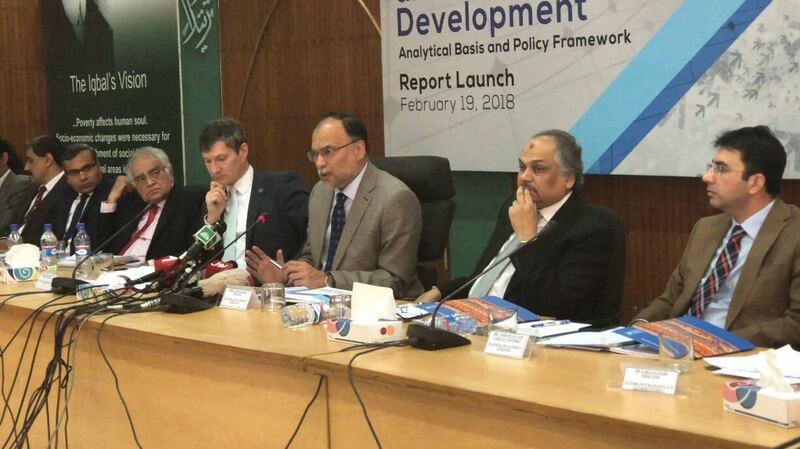 Launch of report "Inclusive and Sustainable Development: Analytical basis and policy framework"
The United Nation Development Programme pakistan and Ministry of Planning, Development and Reforms launched a report titled “Inclusive and Sustainable Development: Analytical basis and policy framework”. 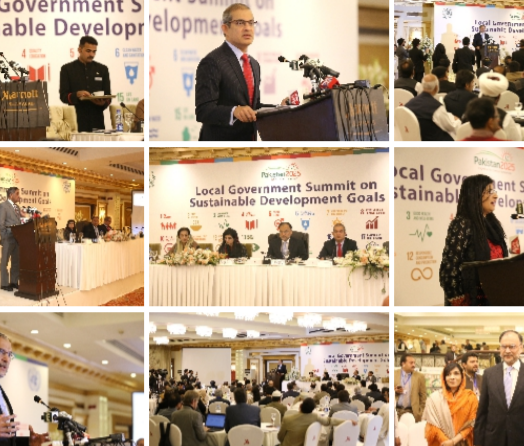 On March 9, 2017, the Planning Commission of Pakistan organised a Local Government Summit on Sustainable Development Goals. The 75 heads of local governments, gathered from across the country, adopted a Declaration calling for administrative and financial empowerment of the district governments for implementing the global goals. 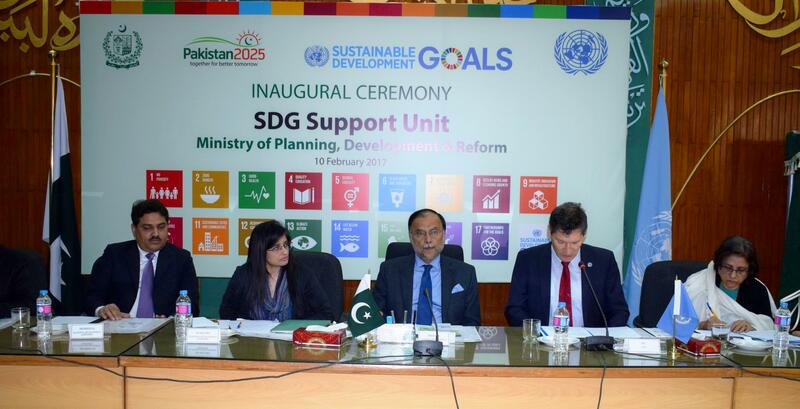 On 10 February 2017, Federal Minister for Planning, Development and Reform Mr. Ahsan Iqbal inaugurated SDG Support Unit at P-Block, Pakistan Secretariat, Islamabad. 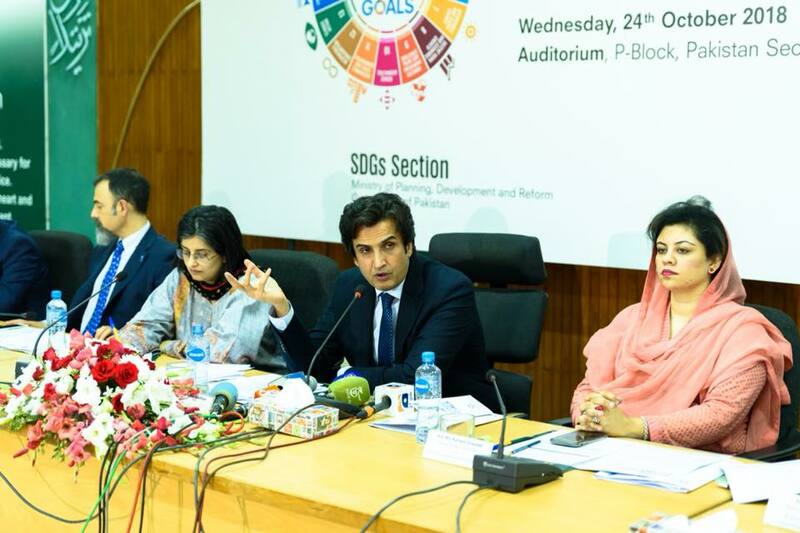 The federal SDG Support Unit created at the Planning Commission will not only oversee implementation of the global goals in Azad Kashmir, Gilgit-Baltistan and federally administered areas but also coordinate with the provinces. 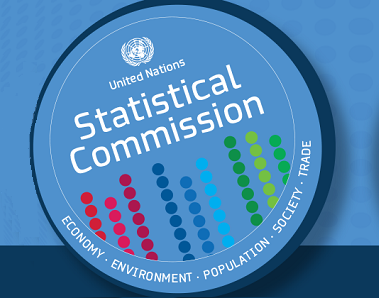 In June 2016, the UN Statistical Commission proposed approximately 241 SDG indicators to review the progress at the national and global level. These indicators will be tracked for monitoring progress at regional, national and sub-national levels. 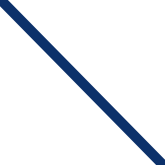 Division of 241 SDG Indicators – 13 global indicators, 59 are national indicators, 49 are provincial and 120 are district indicators. 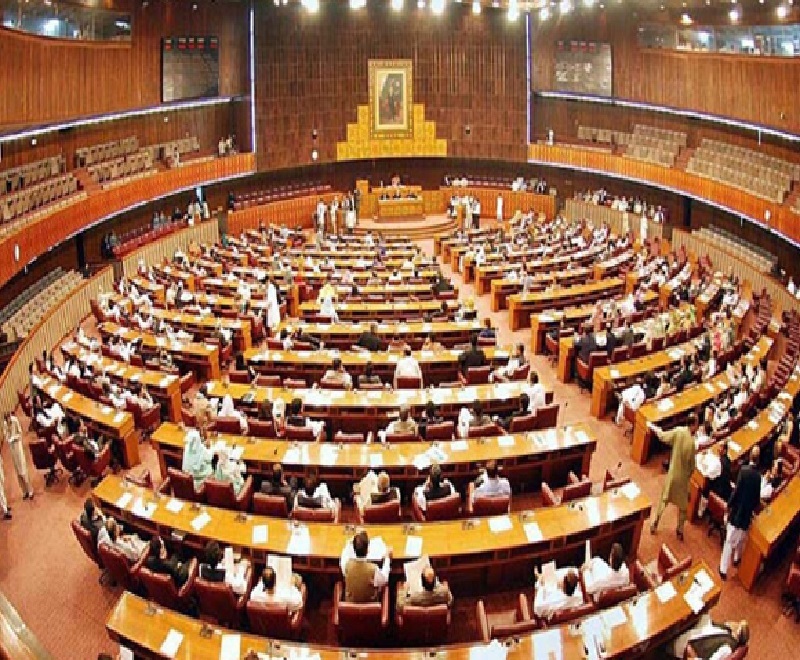 On February 19, 2016 Pakistan became the first country in the world whose National Assembly passed a unanimous Resolution adopting the SDGs Agenda as its own national development agenda and also and established SDG Secretariat. 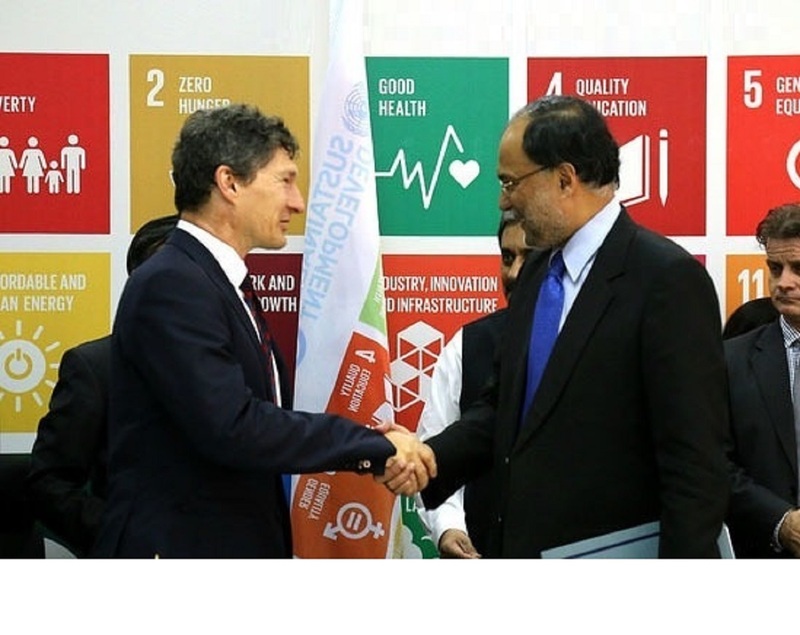 Within a month of their formal global launch in September 2015, the government signed a MoU with UNDP, officially adopting the SDGs as Pakistan Development Goals, a global first. On 25th September 2015, the 193 members of United Nations General Assembly unanimously adopted Agenda 2030, titled “Transforming Our World” at the Sustainable Development Summit held in New York on 25-27 September, 2015.